Increases of up to 4.99% are expected across the country, but libraries, bin collections and other services will still face funding gaps. The Department for Communities and Local Government said local authorities had been given a "historic" four-year settlement, giving them the certainty they needed to plan ahead, with almost £200bn available "to provide the services that local people want". All councils in England can raise council tax by 1.99% in April without having a local referendum. The 151 social care authorities can increase bills by an extra 3% as long as that money goes on social care. Some residents will see even higher rises, as council tax regulations say the cap is based on the average council tax across the area, rather than a maximum for each household. However, the LGA says further cuts will still be needed as councils are being pushed "perilously close to the financial edge". What's the deal with council tax increases? Warwickshire County Council leader Izzi Seccombe told the BBC: "To continue it is really looking like we're cutting into the bones of services that matter to people. "It's not just social care. Things like roads, highways, bus services which are subsidised, libraries, access to leisure centres, waste services, children's services as well." Why will there be a 4.99% rise? But the 151 social care authorities - England's county councils and unitary authorities, which cover the whole population - can also increase bills by an extra 3%. This additional charge - known as a social care precept - was introduced by George Osborne in 2015 to allow local authorities to raise extra money to specifically pay for social care. Some people will pay more as the 4.99% cap only has to be the "average" rise across the area. So for Swindon Borough Council, for example, householders in some council tax bands will see a 3.12% rise, whilst others will see a 7.28% rise - with the average staying within the rules. Will this rise cover local services? Many councils say no and their difficulty stems from a change in the way local services are funded. Money from central government has been cut after local authorities were told to change the way they are funded. In future, they will use council tax and business rates collected locally to pay for services, rather than rely on government grants. By 2020, the grants will be phased out entirely. But the LGA says councils are being pushed "perilously close to the financial edge" by the change and even with the extra money from their residents, they will still need to make cuts to balance the books. What services could be hit? 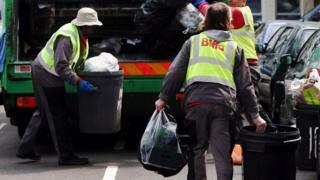 As councils across England tighten their belts, there is a huge raft of services that could be squeezed further. The services they provide range from running recycling centres and organising bin collections through to tackling anti-social behaviour and controlling adoption services. Mrs Seccombe said: "Year on year it is roads and highways and grass cutting that tops the list [of priorities] as these are things that people have to deal with every day." Even these priorities could be looking at cost savings, as well as children's services, leisure centres, transport projects and whatever else each council is responsible for. Is the cost of social care to blame? Councils spent £16bn last year on services for elderly and disabled people after funding from central government was cut by a third, in real terms, during the last Parliament. Mrs Seccombe said an extra £1.3bn was needed for social care in the next financial year alone. And while the council tax rises would raise about £600m, she said that would be swallowed up by paying higher wages to existing staff more when the National Living Wage comes into effect. Lord Porter, chairman of the LGA, said social care faced a funding gap of £2.6bn by 2020. "Extra council tax income will not bring in anywhere near enough money to alleviate the growing pressure on social care both now and in the future and the social care precept raises different amounts of money in different parts of the country," he said. But the government insists it has increased funding for social care by an additional £900m, meaning councils will have £7.6bn of dedicated funding to spend over the four-year period. What is happening elsewhere in Great Britain? 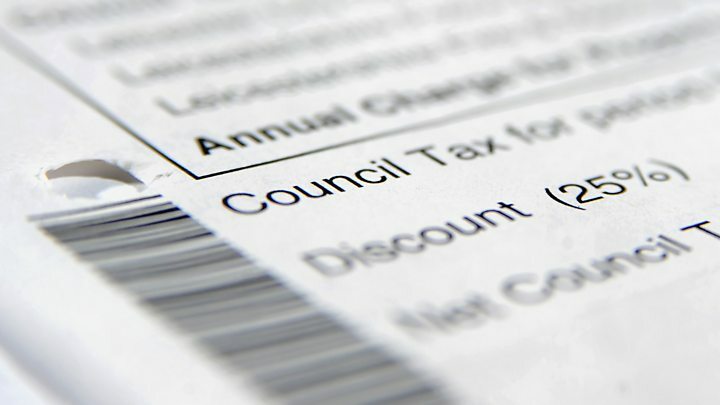 In Scotland, a nine year-long national council tax freeze comes to an end this year and councillors will have the power to raise the basic bill by as much as 3%. Each of its 32 authorities will be announcing their planned rises in the coming weeks. Wales is facing similar pressures, especially with the cost of social care, but the country's social services minister told BBC Wales that increasing council tax was not "fair" and "not an approach we're taking". Rebecca Evans said Welsh ministers wanted to take a longer-term approach towards social care funding but added: "We do need the UK government to help us with this". Social care is a lifeline for people like Maureen Edwards, from Surrey, who said that after she had a fall everyday living was "difficult". She said: "They come in and they get me up in the mornings and they wash me and then they sort of bring me downstairs and I have my breakfast. "It's just like normal living now, I'm very grateful for all they've done for me." But such services are being put under strain by the ageing population and budget cuts. Councils are struggling to provide help, feed, wash or get people dressed in their own home or to pay for beds in a care home and the burden often falls on families. How can social care be funded?